What do paid sick leave in Maryland, limiting drinking water contamination in Virginia, and protecting housing for Chinese Americans in DC’s Chinatown all have in common? These are victories that were made possible by advocacy, led by our nonprofit partners. Advocacy—activities that can influence public policy, including work connecting community members to other decision-makers—is a key tool we use to build thriving communities. One example of a recent victory is the work of Washington Interfaith Network (WIN), which we have helped fund. 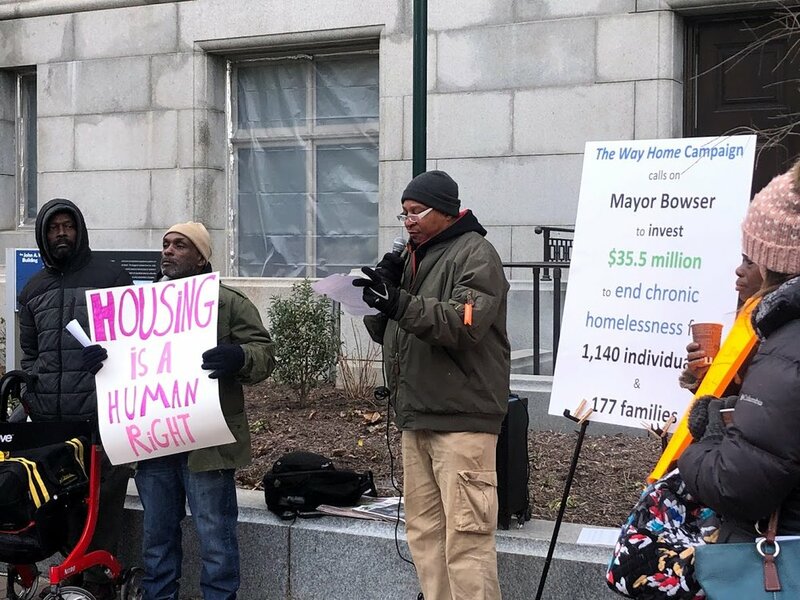 WIN’s campaign in DC’s Northwest One neighborhood engaging community residents and leaders in housing advocacy, led to a plan to build 518 units of affordable housing at 33 K Street NW, formerly Temple Courts. WIN and former tenants have been working with the developer to secure jobs commitments for former and current tenants. Building on 30 years of experience, including advocacy which preserved $80 million of public funding for safety net services in the region, Straw’s current work focuses on housing and ending homelessness. DCFPI is a key partner of the Way Home: the campaign to end chronic homelessness in Washington DC and helps organize major advocacy events led by the campaign. Straw also works with the DC Fiscal Policy Institute (DCFPI), a key partner in the fight for affordable housing and ending homelessness in DC. Their research revealed that in the past decade DC lost more than half of its affordable housing. Last year DCFPI laid out a blueprint for the investments needed to fully address DC’s housing needs. DCFPI’s research shows that extremely low-income families face the greatest need and supports advocacy for DC’s Local Rent Supplement Program, including a 2019 increase which was the largest in years. Another victory is thanks to Housing Counseling Services (HCS). Their advocacy has helped tenants at Wah Luck House, mostly Chinese American seniors, keep their housing in DC’s Chinatown. They helped tenants exercise their Purchase Rights when their building went up for sale. Ultimately, tenants successfully negotiated a contract with the purchaser that preserves the HUD subsidy for 20 years and guaranteed an entire building upgrade. Last March, members of Job Opportunities Task Force spent the day in Annapolis, marching, advocating, and meeting with legislators to advance key issues, including colleges and universities removing the arrest/conviction question from applications. Some recent workforce victories include the passage of the Maryland Healthy Working Families Act. This act will require employers with 15 or more employees to earn up to seven days of paid sick days in one year thanks to work alongside Job Opportunities Task Force and Maryland Center on Economic Policy. Another victory with these groups was the passage of the Maryland Fair Access to Education Act that requires colleges and universities who do not use a third-party admissions application to remove the arrest/conviction question from the initial admissions application, ensuring more equitable access to education. Advocacy remains a key practice for community foundations and nonprofits to make the region more equitable for all our neighbors, including our most vulnerable populations. To read about advocacy in action, check out this blog post from the Potomac Riverkeeper Network about how they worked to ensure passage of a bill to properly dispose of more than 27 million cubic yards of toxic coal ash currently sitting in holding ponds, safeguarding Virginia residents at risk of toxic contamination from pond leakage.